The Federal Reserve Bank decided to keep interest rates unchanged at 1.25%, but signaled an additional hike in December and three more in 2018. More importantly, the central bank announced plans to normalize monetary policy and reduce the $4.5 trillion balance sheet they accumulated through quantitative easing. After the Great Financial Crisis, the Federal Reserve took extreme measures to stabilize the economy by purchasing Treasury bonds and mortgage backed securities to push down borrowing costs. With the economy on much firmer ground, the central bank believes there is no need to purchase bonds at the same scale. They will begin letting maturing bonds roll off of their balance sheet instead of reinvesting them. The process is expected to be gradual and predictable in hopes of provide minimal disruption to the markets. The outcome of monetary tightening (balance sheet reduction and interest rate hikes) is unknown. As fixed income markets digest and react to a new set of conditions and facts, we remain cautious and continue to own high quality bonds and lower than average duration to better protect against a rising interest rate environment. The bond markets delivered positive results during the quarter. U.S. bonds returned 0.85%, municipal bonds returned 1.06%, and global bonds were up 0.70%. Stock markets delivered strong results with international and emerging markets leading the way. Emerging markets performed the best, returning 7.9%. We continue to see improving macro conditions with better economic growth, stronger country balance sheets, and corporate earnings on the upswing. Emerging markets remain reasonably valued relative to developed markets. International markets maintained its momentum from last quarter, earning 5.6%. The markets continue to be supported by the European Central Bank and Bank of Japan through monetary stimulus, leading to better economic data and improved earnings. In addition, international markets benefited from a weaker U.S. dollar, which helped boost investor returns. U.S. markets had another good quarter, up 4.6%. The current bull market has become the second largest bull market since World War II gaining nearly 270% since 2009. A favorable economic backdrop, strong earnings, and loose monetary conditions continue to drive markets higher. 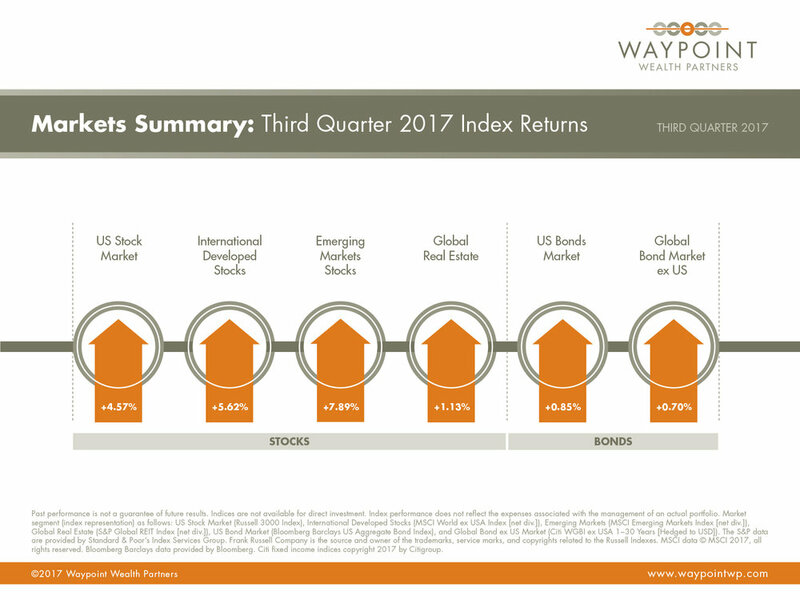 Given current valuations and the incredible performance U.S. investors have enjoyed, it is important to moderate expectations for future returns. While U.S. markets are fully priced relative to history, valuations alone do not trigger bear markets. Valuations can remain elevated for years in the later stages of a bull market. The U.S. economy continues to grow at a slow and steady rate, extending the economic expansion to 99 months. The economy is in the later stages, but barring any unforeseen circumstances such as war, recession risks remain muted in the near term. Many of the leading economic indicators we follow are not showing signs of stress. The Federal Reserve Bank believes the U.S. economy no longer needs emergency measures of support and will continue to normalize monetary policy. Globally, we continue to see economic momentum particularly from the Eurozone and Japan. Low interest rates, coupled with a stronger labor market and consumer confidence fueled consumption and investment in Europe. Japan benefited from Bank of Japan’s commitment to monetary stimulus in hopes of stimulating economic growth and fighting the deflationary pressures that have plagued the country for years. Over the coming weeks and months, as anniversaries of major crisis-related events pass (for example, 10 years since the bank run on Northern Rock or 10 years since the collapse of Lehman Brothers), there will likely be a steady stream of retrospectives on what happened as well as opinions on how the environment today may be similar or different from the period leading up to the crisis. It is difficult to draw useful conclusions based on such observations; financial markets have a habit of behaving unpredictably in the short run. There are, however, important lessons that investors might be well-served to remember: Capital markets have rewarded investors over the long term, and having an investment approach you can stick with—especially during tough times—may better prepare you for the next crisis and its aftermath. 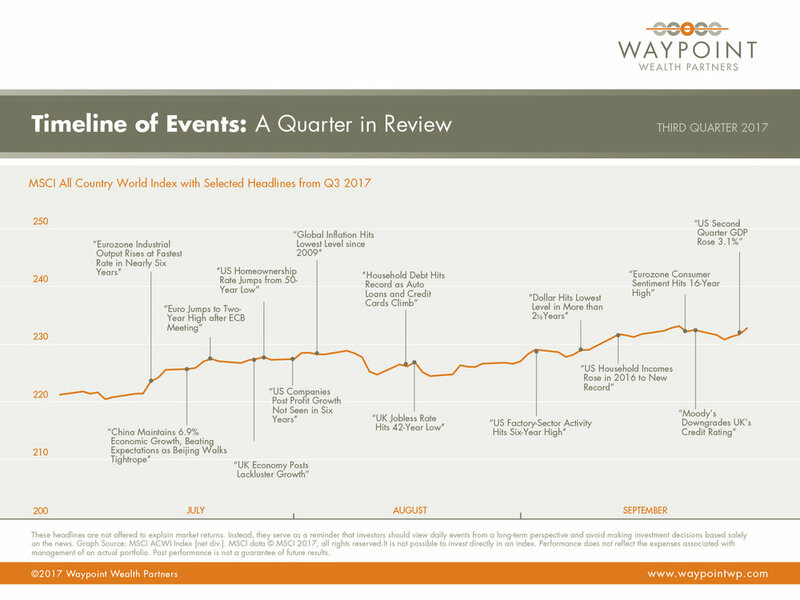 Although a globally diversified balanced investment strategy invested at the time of each event would have suffered losses immediately following most of these events, financial markets did recover. In advance of such periods of discomfort, having a long-term perspective, appropriate diversification, and an asset allocation that aligns with their risk tolerance and goals can help investors remain disciplined enough to ride out the storm. A financial advisor can play a critical role in helping to work through these issues and in counseling investors when things look their darkest. Adapted from “Lessons for the Next Crisis” on Dimensional’s website, September, 2017. Dimensional Fund Advisors LP (“Dimensional”) is an investment advisor registered with the Securities and Exchange Commission. Diversification does not eliminate the risk of market loss. There is no guarantee investment strategies will be successful. Past performance is no guarantee of future results. All expressions of opinion are subject to change without notice in reaction to shifting market conditions. This content is provided for informational purposes, and it is not to be construed as an offer, solicitation, recommendation, or endorsement of any particular security, products, or services. Newer PostTo Bit or Not to Bit: What Should Investors Make of Bitcoin Mania?